The top view is of the ambulatory between the Hypostyle Hall and the Sanctuary area of the main temple. 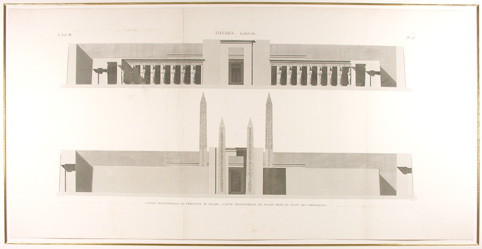 The bottom view is a cross section through the central courtyard and the obelisks of Tuthmosis I and those of Hatshepsut. The four red granite obelisks were 72 feet tall and most estimates place their weight between 128 and 143 tons each. The obelisks in the background were elevated on a base and were constructed by the female pharaoh Hatshepsut. As was common in royal families, she married her half-brother, Thutmose II, who had a son, Thutmose III, by a minor wife. When Thutmose II died in 1479 B.C. his son, Thutmose III, was appointed heir. However, Hatshepsut was appointed regent due to the boy's young age. They ruled jointly until 1473 when she declared herself pharaoh. Dressed in men's attire, Hatshepsut administered affairs of the nation. Hatshepsut disappeared in 1458 B.C. when Thutmose III, wishing to reclaim the throne, led a revolt.